Looking for a pick me in the middle of the week. Then enjoy our Pick Me Up Smoothie. Place all the ingredients into the blender in the order they are listed. This smoothie is great for kids as an after school snack. It gives them comfort after a long day at school and a little energy to finish out their day. For a little added sweetness pour a small amount of the pineapple juice in with the other ingredients. Don't you just love how wonderfully yummy and easy smoothies are! This sounds absolutely delicious! My kids and I are big into smoothies, so we will have to try this. My kiddos love smoothies and love to help make them. The small amount of pineapple juice is a great suggestion - especially for the "too" green ones! This looks delicious and my kiddos love smoothies. Love the pineapple juice suggestion too! Yummy i love quick and easy pick me up smoothies. this one has lots of my favorite things in it. I really wish smoothies could be made without bananas! I am really allergic to them. This one sounds really yummy. This look yummy! I've been looking for great smoothie recipes since I got my lil' Ninja blender - so I'll add this to my stash! Thanks! OH YUM! My son is so into smoothies these days, he would love this one. 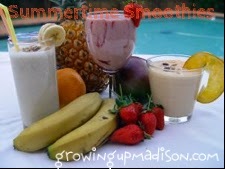 There is nothing I like more than a smoothie on a hot summer day. It really is the official drink of summer in my book! Yours sounds awesome! I'll have to give this recipe a try, haven't made smoothies this year yet, must get out my blender. I love love love smoothies, this looks like one I would really enjoy! Smoothies can be simple yet they are nutritious.